The Citizen Publisher Cal Beverly (L) interviews state senate candidate Tricia Stearns. Screenshot from Facebook Live video. The Citizen in its May 2 Facebook Live broadcast featured Realtor and District 16 state Senate candidate Tricia Stearns, who will face off against incumbent Sen. Marty Harbin in the May 22 Republican primary. Above, The Citizen Publisher Cal Beverly (L) interviews state senate candidate Tricia Stearns. Screenshot from Facebook Live video. Both Stearns and Harbin were invited to do a joint video interview, but their prior commitments resulted in two separate interviews being set. Harbin was interviewed May 8, after print deadline. A report of that interview will appear in next week’s paper. 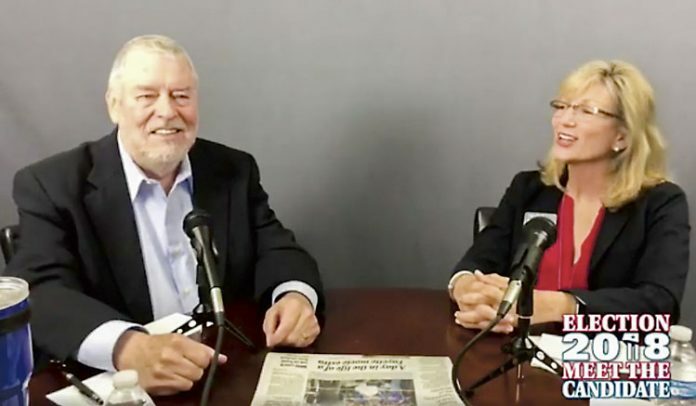 Stearns at the outset of the interview with The Citizen publisher Cal Beverly said the people she spoke with indicated that they were ready for the most effective senator and not the least effective senator. A resident of the area since 1995, Stearns, aside from being a Realtor, started the farmers’ market in the shopping center in Aberdeen Village and the community garden on Kelly Drive. Stearns was asked what laws she wanted to make that are not currently in place and what laws she would want to see undone. Stearns said the best thing that should be done is to stay out of the way of citizens. Stearns said Harbin did not vote for the data processing (House Bill 696) or film industry tax incentives. The data processing tax incentive will bring $2.5 billion to Douglas County, said Stearns. “These tax incentives make us the envy of a lot of states, so I would definitely keep the tax incentives,” said Stearns. Asked what she would do differently than Harbin, Stearns began by reiterating that she would keep the tax incentives and would not have brought the religious freedom bill up for the second time. On another topic, and as a newcomer to politics, Stearns was asked why she started at the state Senate level. Her statement was followed by one that asked why she should be trusted with lawmaking at the state level. Stearns said she would be a full-time lawmaker, not one that puts in only 40 days during the annual General Assembly period. Asked what would make her different from a Democrat, Stearns said she is fiscally conservative, believes in the 2nd Amendment and is pro right-to-life. Another question asked Stearns what she would say to the person that voted for Harbin to change their vote for her. Asked her opinion on Peachtree City expanding into Coweta County, Stearns was asked how she would respond if that action required local legislation. Stearns said “you have to let the mayor and council do their job,” adding that she might weigh in on the issue as a private citizen. Stearns was asked what kind of senator she would be for millennials, including in bringing them back to Fayette. Stearns was asked if she would involve Fayette in a regional transportation authority. District 16 includes Fayette, Spalding, Pike and Lamar counties. 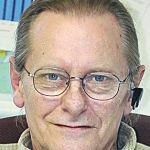 The winner of the May 22 primary will face Fayetteville Democrat and writer Bill Lightle in November. The Citizen Facebook Live interview with Stearns can be viewed in its entirety at https://www.facebook.com/mycitizen/videos/10156127746457860/.